If you are looking to Buy Gaffa tape you have found the Right Place. For over 20 years we really have been the "Gaffa of Tapes" and back up all our Prices with our Price Beater Guarantee... Don't pay more for your Gaffa Tape, give us a call, tell us what you pay, we will beat it* Call 01268 768 768 Now. Our professional grade, easy peel, low tack gaffer tape available with a matt or gloss finish. Our general purpose cloth tape in our three standard colours: Black, White or Silver. 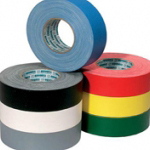 Our general purpose cloth tape in a wide range of colours. Our professional grade cloth tape perfectly suited for use in the TV, Film and Theatre Industries. Unbleached, natural cloth tape. It can be painted so is ideal for use in set-making for film and theatre or can be used as grip tape for sports and gymnasium equipment.